Nearly every year after the Thanksgiving feast at my sister's house I lug the turkey carcass home, leave it on my porch overnight (as my fridge isn't large enough to accommodate it), and make broth with it the next day. The simmering broth makes my house smell delicious and drives my two dogs nuts (but I do put some on their food as a treat). After packaging it in increments I freeze it and use it for a few weeks--or months--thereafter for whatever recipe calls for chicken broth. It's so easy to make and offers a really delicious flavor. 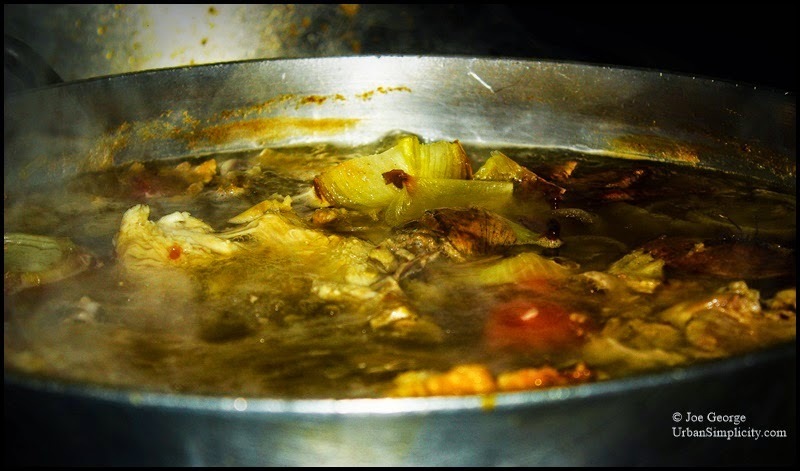 The simple recipe for broth is below, but if you'd like to read an article I wrote for Artvoice sometime ago regarding other Thanksgiving leftovers, click here; and here's a link to an article on broth itself. Looks great. Not too far off of mine. I got mine started right after dinner.....lol. I could not help myself. If I have any gravy left then I add a little of that too.I have sent some back with my daughter when she needed it. Love the smell of soup simmering.